UNIDOS Podemos may oust the Socialist PSOE as the main opposition party in Spain as counting gets underway in the general election. 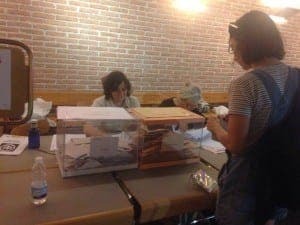 Polls closed at 8pm, but at 6pm 52.21% of Spaniards had voted, seven points down from December 2015 and the lowest figure in Spain’s democratic history. An early exit poll for La Sexta predicted the PP would win between 117 and 121 seats, Unidos Podemos 91-95, the PSOE 81-85 and Ciudadanos 26-30. As predicted, no party looks to have secured an overall majority of 176 seats in Congress. But if the poll is correct, a pact between the PSOE and Podemos may be enough to form a government. IU leader Alberto Garzon, whose party have joined forces with Podemos, described it as an ‘historic opportunity’. Turnout in Unidos Podemos strongholds such as Madrid and Catalunya was lower than expected. Spain has been without a government since December 2015 with months of negotiations failing to break the deadlock.